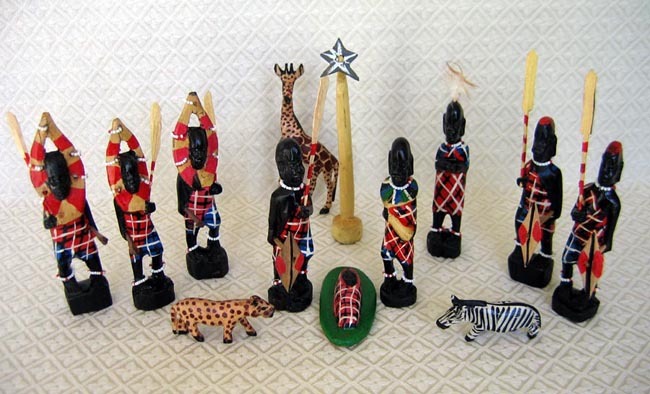 This Nativity set is carved from ebony by Joseph Kisilu. The set is painted by Steven Kyalo. Both Joseph and Mary are bald because, according to the Maasai culture, when a baby is born the father and the mother shave off all their hair as a symbol that they have conquered or have been relieved of a heavy burden. Mary wears a beautiful necklace and carries a gourd filled with milk to feed the baby Jesus. Joseph carries a spear and shield as a symbol of his duty to protect his sacred family. The angel is represented by a Maasai messenger who wears a feather on his head. The two shepherds with red hair, each carrying a spear and shield, are Maasai warriors who protect the village and herds from predators. The three wise men are Maasai seers; they wear headdresses and carry a club and spear. The three wild animals signify that the Maasai live in the African wild with these animals. A star and pedestal complete the set. The Joseph figure measures 5.5 inches tall (excluding his spear). The set was sent to us from our friend Steven Kyalo, who runs an artisan workshop in a slum called Gikomba near the city center of Nairobi, Kenya. Steven also runs an orphanage and school to help 89 orphans in Nairobi; he works very hard to help others. To learn more about Steven’s wonderful service, view the Helping in Kenya photo album on our Facebook page.